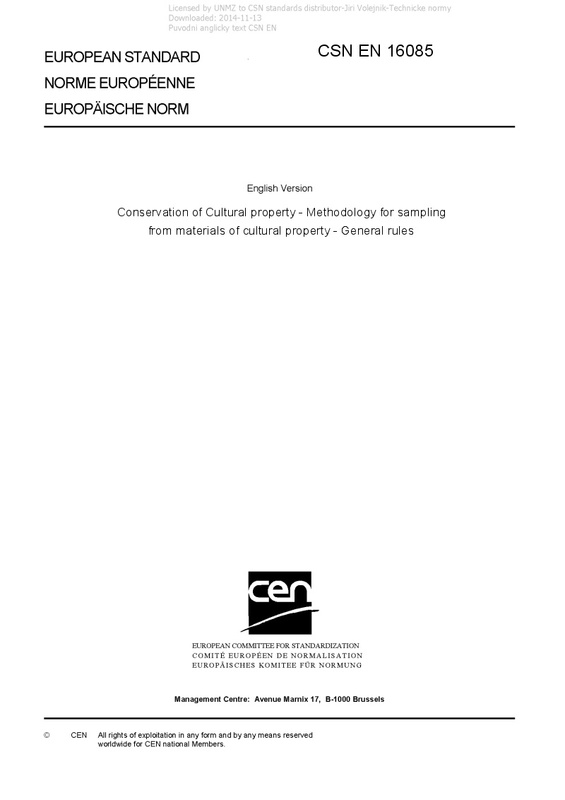 EN 16085 Conservation of Cultural property - Methodology for sampling from materials of cultural property - General rules - This European Standard provides a methodology and criteria for sampling cultural property materials for their scientific investigation. It covers, for example, how to characterize the material(s), assess the condition, determine the deterioration causes and/or mechanism(s) and decide on and/or evaluate the conservation treatment(s). Apart from sampling, this document also provides requirements for documentation, and handling of sample(s). This European Standard does not deal with the decision making process for taking a sample nor how the sample is to be used.